This is a super, super easy, and super delicious summer lunch, inspired by one of my favorite restaurant salads. 1.) Pile beautiful fresh greens on a plate. 2.) Halve an avocado, and put one half on the plate. 3.) 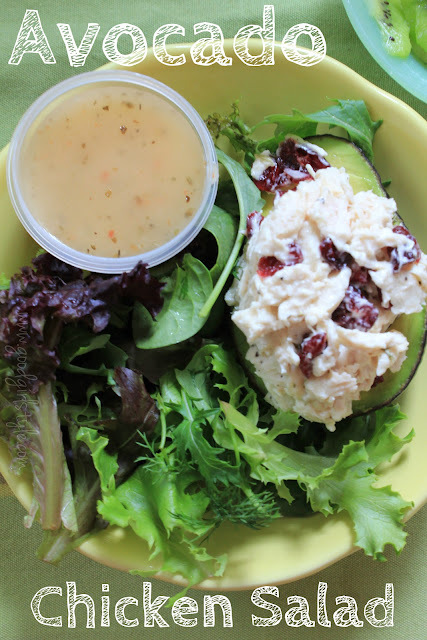 Whip up some chicken salad with whatever you have on hand, and scoop it into the avocado half. 4.) Grab some veggies if you have some (carrots, cherry toms, and cucumbers are perfect here), and throw those on (obviously I was low on veggies this time around, oops). 5.) Make or buy a delicious champagne vinaigrette, and serve alongside. 6.) Eat all together--a bit of salad, a bit of chicken salad, and a bit of avocado, all dipped in dressing. Mmmmmmm!!!! I should have made this again tonight. Instead, I decided in my brilliance to turn on the oven and bake a pizza. And then I burnt my $6 gluten-free pizza to a crisp, all while turning my house into more of a sauna than it is already. So take my advice: on a hot summer evening: make this chicken salad! It's perfect!